The Iron Curtain has been cast aside. The Berlin Wall has fallen. Germany has been reunited. And F. A. Hayek's forceful predictions of the inevitable failure of socialism and central economic planning are now rendered irrefutable. Yet Hayek still rightfully cautions us to heed his arguments, warning that "in economics you can never establish a truth once and for all but have always to convince every generation anew." The Trend of Economic Thinking captures Hayek's views on political economists and economic history -- on Mandeville, Hume, Cantillon, Adam Smith, and Henry Thornton. Framed by insightful editorial notes, fifteen newly collected essays -- including five previously unpublished pieces and two others never before available in English -- provide a fascinating introduction to the historical context of political economy and the evolution of monetary practices. 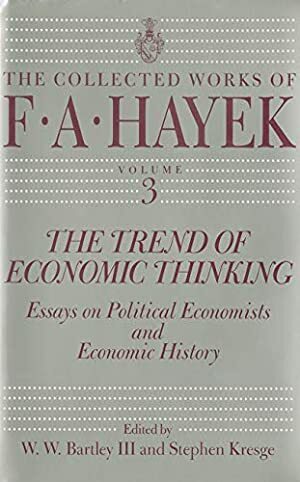 In a highlight of the collection, "On Being an Economist," Hayek reflects on the influence of economists, the time required for new ideas to take hold, the best way to educate economic theorists, and the need to follow one's own interests, often in opposition to fashionable beliefs. As always, the words of this outspoken scholar are sure to provoke debate. Log In to track Stephen Kresge on eReaderIQ. to be notified each time the price drops on any book by Stephen Kresge. to stop tracking Stephen Kresge. Log In to track W. W. Bartley III on eReaderIQ. to be notified each time the price drops on any book by W. W. Bartley III. to stop tracking W. W. Bartley III. We started tracking this book on October 23, 2018. This book was $13.78 when we started tracking it. The price of this book has changed one time in the past 183 days. The current price of this book is $13.77 last checked one day ago. We last verified the price of this book about one day ago. At that time, the price was $13.77. This price is subject to change. The price displayed on the Amazon.com website at the time of purchase is the price you will pay for this book. Please confirm the price before making any purchases.